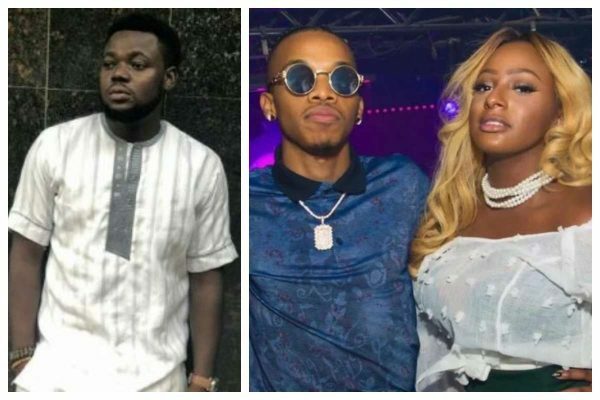 A talent manager known as Kelly has accused DJ Cuppy of sleeping with popular singer, Tekno. 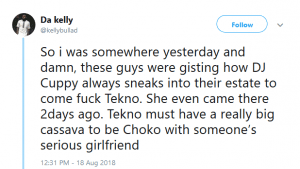 Kelly took to his Twitter page to level some serious allegations against popular DJ, DJ Cuppy. It was not until January this year before DJ Cuppy made her relationship with Asa Asika offical to the public. DJ Cuppy mentioned during a live video session with her fans that she was getting ready for a dinner date with her dad and someone “Very special” to her. Yes, VERY SPECIAL! And although the 25-year-old Dj mentioned no names, that special person appeared to be Asa Asika, the manager of musician, Davido. The dinner meeting obviously ended well from the body language of the people in the picture. Looks like DJ Cuppy is really serious about getting married this year and is already making the right moves! First was to introduce the man in her life to the other man in her life, her father!